One-light hanging fixture with distressed clear glass and etc.hed opal glass. A contemporary interpretation of antique nautical lanterns. Can be used as a single piece or in multiples to obtain desired look. 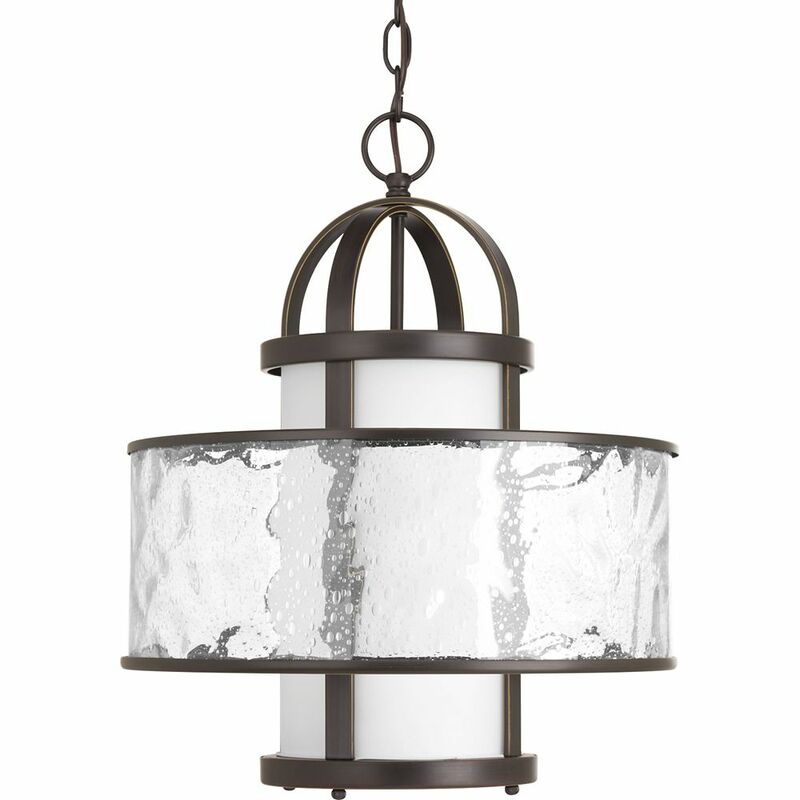 One-light foyer fixture with white etched glass from the Bravo collection. Linear elements stream throughout the fixture to compose a relaxed but exotic ambiance. Generously scaled glass shades add distinction against the Antique Bronze finish and provide pleasing illumination to your room. Bravo possesses a smart simplicity to complement today's home entirely with confidence and style. Vintage and modern in styling, this pendant is born from industrial roots in both form and function. An authentic fresnel type glass lens refracts light from the metal shade. The lens is supported by a series of decorative and functional metal fittings for easy access to change the light bulb when needed. Stem-type hanging system provides several options for installation height and includes 6 in. of chain for installation on sloped ceilings. Bay Court Collection 1-light Antique Bronze Foyer Pendant One-light hanging fixture with distressed clear glass and etc.hed opal glass. A contemporary interpretation of antique nautical lanterns. Can be used as a single piece or in multiples to obtain desired look.